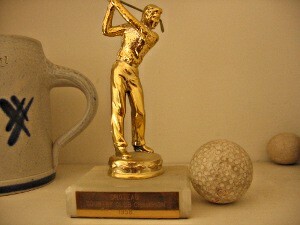 I was 4 years old when the 1958 Choteau Country Club Champion brought home this trophy. Although he brought home many more ornate trophies over subsequent years, this first one always had the place of honour. And if you think I inherited any of those skills, I should find the smiley face on the last golf ball I flailed at years ago!